"When he gave his agricultural course Rudolf Steiner mentioned the fact that it would be beneficial to add clay in appropriate doses to sandy soils. He wanted to indicate the dosage at a later time. Later on this did not occur in his lectures. In 1955 I asked Dr Ehrenfried Pfeiffer about it. He told me that Rudolf Steiner had given him the information at a later date. Orthoclase, ie Potassium feldspar, must be ground to a fine powder. A quantity the size of a bean is mixed with the soil of the field to be treated. 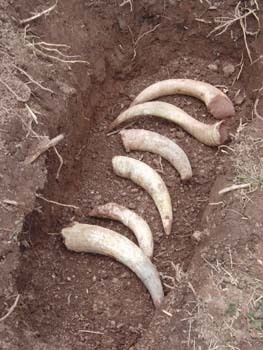 The horn of a cow is filled with the mixture and buried in the field during the summer. In November it is mixed and sprayed like Horn Silica. This process presents a possibility for further development, as is evident from the numerous efforts by Alexandrov, dealing with siliceous bacteria that originate in the soil and animate potassium alumino-silicates. Alexandrov has achieved good results with siliceous bacteria on many varieties of cultivated plants. (Woronkov; Silicon. Akademie Verlag, Berlin, 1975, p. 30: compendium of the work of Alexandrov.)" does this not have similar effects as the Silica in the plant book? it seems to me that this is comparable in its effects on sandy soils, by making them much better at holding water and thus support plant life, which at decay adds organic matter. I think that we should postpone discussion of what is in your book until it is available in the shops. I would find it frustrating to have the discussion going on if I could not join in due to information being unavailable. Mark wrote: I think that we should postpone discussion of what is in your book until it is available in the shops. I would find it frustrating to have the discussion going on if I could not join in due to information being unavailable. So where were we? I think that there's been reasonable chance to get hold of your book now. What were you saying .. similar effects of Silicea in your book.. when compared to the potassium feldspar of Dr steiner's clay preparation. I wrote this for the UK BD magazine Star and Furrow, It seems apt here as it collects the clay prep information of which I am aware. “The forces coming in from the cosmos and being caught up underground must be able to flow upwards again, and the substance which brings this about is clay. Clay is the mediator through which the cosmic activity in the soil is enabled to work from below upwards. In actual practice this will give us the key to the handling of both clay soil and sandy soil according to the particular way we may wish to cultivate. But we must first know what is actually happening. How clay is to be described and treated in order to make it fertile are important but secondary considerations. The first and foremost thing to know about clay is that it promotes the cosmic upward flow…..
…. In the case of a soil which does not in itself promote the required upward movement of forces which ought to work upwards in the Winter period, it is well to add clay in a proper proportion. (I shall indicate this proportion later on.) In this way we enable the soil to carry those forces upwards to make it effective in the realm of plant growth above the Earth. Wouldn’t it have been great if Dr Steiner had had time to indicate the proper proportion of clay to add so that the upward movement of the distant forces could be facilitated? There has been original work to try to make this process effective using clay in various preparations. Of those that I am aware Hugo Erbe was the first to go public with his own clay preparation. I suspect that using this idea of clay as the go-between for lime and silica he sought out rhythmical manifestations of clay and of a sheath whose purpose was also rhythmical. After using the pericardium for a while he came to the sudden realisation that the oesophagus of a cud-making animal was the sheath he had been seeking. This should be filled with ‘brick clay’ that had been through a mindful rhythmical process. The clay should be left for seven weeks and then dispersed in water to make a ‘slip’. This would be allowed to settle and be dispersed in fresh rain water a further six times before the sediment was put into the oesophagus. Once tied and contained this would be put in a hollow tree to be amongst the rising and falling sap. 10g in 100 litres would be sprayed out in spring . Peter Bacchus told me that the horn preparations were sometimes made with a clay plug over the contents before they were buried. In this way a clay element was introduced into the field sprays although, if I have remembered our chat correctly, it does seem a little haphazard. 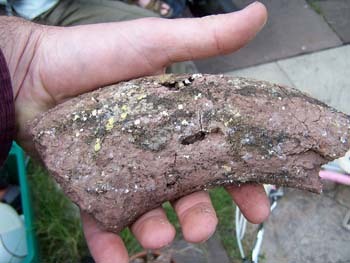 More recently Greg Willis had developed his own ‘horn clays’. 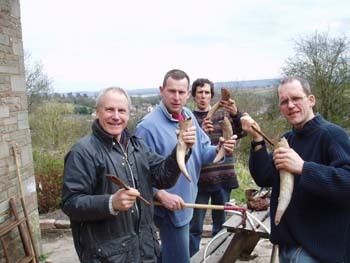 Greg is one who can receive inspiration and the inspiration which came to him was also clear: cow horns should be stuffed with bentonite clay and buried from equinox to equinox over the solstice. This creates two clay preparations that have been interred for six months which either gather the growing forces of spring or the maturing forces of autumn. These ‘6 month’ horn clays are used in Willis’ spring and autumn field and foliage sprays, and he is convinced about the benefits of using his ‘missing preparation’ in the mixes when used in the right season. Greg also uses 12 month clays and interested readers are referred to GW Agriculture’s literature for details of their use . Enzo Nastati from ‘L’Albero Della Vita’ in Italy makes his clay preparations during the holy nights. This ‘argilla’ is used widely throughout his many preparations for specific agricultural tasks, in combination with potentised biodynamic preparations and usually with gold. I trust this will be of particular interest to those who were fortunate enough to attend his recent UK lectures. Those who missed these events may be heartened to hear of the longer UK course currently being finalised for winter 2007-08 . It was only after coming to know of all these different clay preparations that I read that there is indeed an oral route back to Dr Steiner and his missing indication for clay. "When he gave his agricultural course Rudolf Steiner mentioned the fact that it would be beneficial to add clay in appropriate doses to sandy soils. He wanted to indicate the dosage at a later time [but…] this did not occur in his lectures. In 1955 I asked Dr Ehrenfried Pfeiffer about it. He told me that Rudolf Steiner had given him the information at a later date. So colleagues, let’s go to it and see which one works best for us, and please don’t forget to share your findings. I've put up some photos of a horn-clay 'experiment' for you to see. The first one is the group of Water Association people filling the horns.The second is just the horns in the ground waiting to be backfilled. The last is the clay once removed from the horns after 12 months in the ground. What happened to the plants when sprayed with this?